But this year, with 2 out of 7 on day 1 there wasn’t really a chance of that 🙂 The competition was so good, even the lower rated players seemed to not make any clear errors, and every win was a hard battle. In preparation for the OWC I had practiced 4 openings to what I thought was a good standard 🙂 “Scorpion Classic” was one, I got a chance to play Scorpion classic about 3 times on day 1, and lost all times. I think so many players know the responses as white so well, that it gets to the late midgame / early end game, with white having lots of options and black with barely any. Obviously makes it really hard for black to stay in the game. The last game of the day as black, I resorted to my old favourite which is also quite difficult (but I enjoy) – Danish / Shaman, and the opponent played a good line, and beat me clearly. 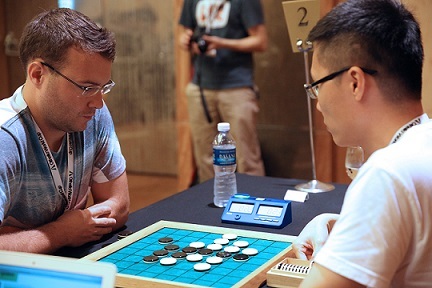 Yan Song was the winner of the final 8 and the new “King of Othello”. He had a tough run as expected and he knocked out the previous King of Othello in the first final, 32-32. I think time use could have been a factor as there was an obvious looking corner move for Junya which he played and was a draw, he could have thought about it more (if he had time) and counted some other possibilities to find a +2 win. It was a very difficult line and I don’t think many players in the world would have picked it, it shows how much thought needs to be put into every move against the top players. Yan Song was a very gracious winner and said that he was very lucky to win against so many good competitors, and happy to have met so many new friends. I managed a win against Singapore, and lost in a close game to Tetsu Satani against Japan. I unfortunately blew a win against Tetsu by not using my time well enough – I had a white parity win – but I had to spot a swindle and avoid it. As I had very limited time and several moves to flip (30 seconds and about 4 moves or so) I made a move a little bit too quick knowing I may get swindled but still I felt I had to go with what looked like the obvious move as I didn’t have enough time left to think. Overall it was a fantastic tournament and well run by Alex from Singapore, I encourage everyone to try and qualify for Australia and play in WOC Thailand! Thanks to everyone for the encouragement for this OWC! Especially Scott and George for all the pre-OWC practice. P.S I’ll be sending out a few othello puzzles in the next few weeks based on some OWC games. There was some really interesting positions that I want to show everyone.